Battle for Sularia is an exciting strategy card game filled with tons of deep strategy, card synergies, and combos. Many which can be easily overlooked by players. The beauty of these five cards listed below is that your opponent will most likely not be prepared to handle them. The Battle Begins and Blood, Profit, and Glory both delivered outstanding Jotune cards, but one of the most overlooked cards in the sets was the Type 1 Site Bergheim. Bergheim is the home of house Hrothgar and provides each Jotune site with a +0/+2 to its stats. This makes many of the Jotune sites very large and more difficult for an opponent to take out in an attack. Coming in at a whopping 6 Influence, Bergheim normally be too late in the game to have an impact, but many overlook a very powerful ability on Lord Oathki "The Hawk." Jotune players are very likely already using Lord Oathki "The Hawk" and can find his ability to not be part of their normal plan. With Bergheim, Lord Oathki is capable of dropping the site for 5 Influence versus 6. Oathki's ability is very powerful in a capable battle commanders hands as it enables Bergheim to drop onto the battlefield at a very pivotable moment. Bergheim's defenses are massive with its base defense at 14 it is the largest defensive site in the game. Combined with its own ability Bergheim is capable of reaching as high as 16 defense. Let's not forget to take a close look at Lord Fenris who synergizes perfectly with "The Wolf's Den" and provides an additional +0/+1 to your Jotune sites. Bergheim combined with it's Lord has a total of 17 defense , making a lone Hekaton Warhulk weep as it cannot get through its defenses. Often overlooked for sexier condition cards such as Art of War, Fire from the Sky synergizes perfectly and can completely change the scope of combat in Battle for Sularia. With each flying combatant able to provide an additional two points of damage to an adjacent site, Fire from the Sky is the perfect resource denial tool. Solomon Fayd, an Exsularian, knows exactly how painful Fire from the Sky can be as the Jotune destroyed his whole tribe from the volleys. One of the common misconceptions about the card is how it works in multiples. Each copy of Fire from the Sky provides the Jotune flier with two separate triggers of Barrage 1:2. Which means that a Jotune player can either deal 2 damage to 2 separate sites or deal four damage to 1 site. 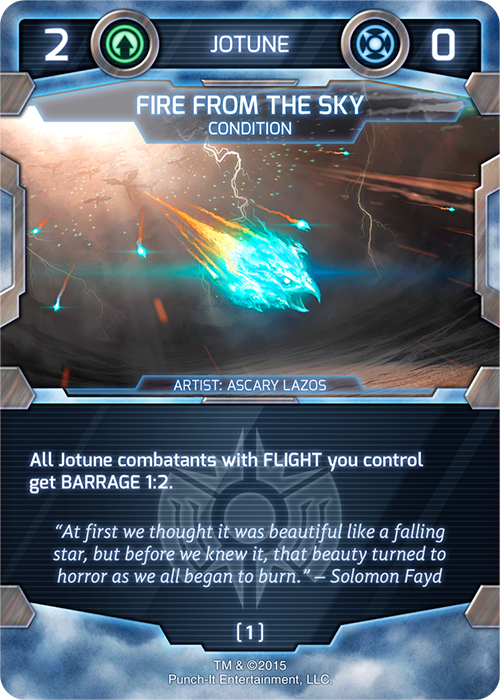 What this means is that each copy of Fire from the Sky acts in a similar fashion to Art of War in so much that it provides two additional damage, assuming that you have that type 1 Jotune combatant in play to enable Art of War's maximum +2/+2. The Jotune can leverage 5 of their 11 combatants found inside of the Battle Begins and Blood, Profit, and Glory to enable Fire from the Sky and its potency. Lets also not forget the Synergy of Fire from the Sky combined with a Vassad Saboteur for the ultimate direct damage output. Gray Harriers are often forgone for high impact 3 construction cost combatants such as Lady Worgana, Lord Oathki, and even Dr. Lehner "Time Hopper." Often bypassed for these cards the power of a 2/1 flying combatant for one sularium is quite easy to look past. The Jotune are a faction that typically has to survive using cunning and wits because they are unlikely to win the resource battle against the Synthien and the now alpha released Protoan and Exsularian. Because of this, each turn should be about maximum sularium efficiency and players should be trying to get as many dangerous Jotune combatants on the battlefield as necessary. In other competitive card games, the value of a 2/1 flier for one resource is an obvious shoe-in because sites do not exist in those games. 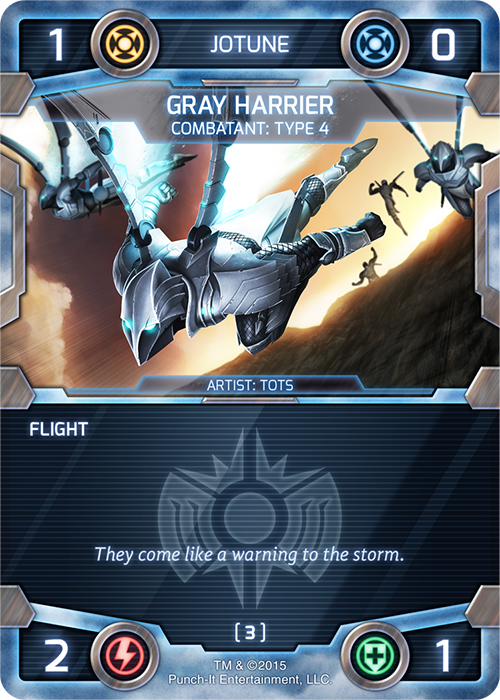 In Battle for Sularia, the Grey Harrier is not really an early game card, but instead a mid-game support engine. They are great to land on the battlefield on turn one or two, and in some rare instances, the Gray Harrier player may actually get to deal 2 undefended damage to their opponent on turn 2. But their real power is understated until the Art of War comes online. Starting on turn 4 with the play of Art of War, each Gray Harrier grows to match a Cloud Falcon in attack power for 1/3 the resource cost. If there type 1 on the board than each Grey Harrier instantly becomes a Red Condor, for 1/4 the resource cost. Many competitive players will attest to the power of the Grey Harrier, but will also argue that they are too expensive in the deck builds. As we stated before Gray Harrier's are excellent enablers of the condition card Fire from the Sky. They are arguably the best proponents for pushing Fire from the Sky to its maximum potential since it can be done as early as your turn 3 if you can land the coveted turn 2 Lord Oathki, into turn 3 Storm Citadel. Instantly you have a whopping 11 attack and 4 barrage damage to play with. In your next Jotune build, consider how to play 3 - 4 copies of Grey Harrier and how it can drastically up your attack potential going into the late mid game and into the final rounds. 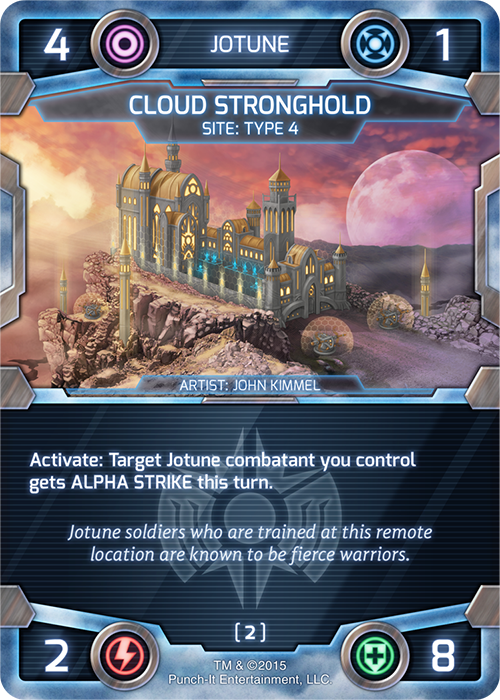 Cloud Stronghold is a card illustrated by our very own John Kimmel and an excellent overall choice in Jotune decks for a couple of key reasons. First, many Synthien and Jotune competitive players are incorporating It's a Trap into their decks because of the defensive firepower it offers and the ability to remain on the offensive. Many times It's a Trap can two for one your Jotune combatants, which leaves the Jotune in a bad position from a tempo perspective. There are very few effective answers to powerful tactic plays insides of The Battle Begins and Blood, Profit, and Glory. However, Cloud Stronghold can serve as an excellent answer to the tactic card. If your opponent drops It's a Trap, give your combatant alpha strike, so instead of losing the combatant to the alpha strike damage of the site, your combatant can still deal damage and potentially kill the site, leaving your opponent in a more critical state. Secondly, Cloud Stronghold serves as a very powerful defensive card for lining up your Jotune combatants against attackers. Many players underestimate the value of an alpha strike defender, but the impact on the attacking combatant can be enormous. I have seen on multiple occasions a Cloud Falcon and a Vassad Saboteur eliminate a Hekaton Warhulk before it even got to deal its damage. Don't have the Saboteur? No problem an It's a Trap of your own plus an Alpha Striking Gray Harrier or Cloud Falcon and say goodbye to even the highest defense attacking units in the game. Cloud Stronghold can even be played as early as turn 3 to come online with your It's a Trap's by simply getting your Lord Oathki "The Hawk" into play as soon as possible. Many savvy Jotune deck builders have reduced the number of Security Posts in their deck build to add Storm Citadel, and Cloud Stronghold can also be easily added to these lists as well. It's also important to understand the value of the base two attack of the Cloud Stronghold and how it further synergizes with It's a Trap. Bolthorn Warlord, received its own deck builders challenge on our Punch-It Entertainment YouTube channel last year. You can find that video below, where now lead developer Neil Mohlman and myself discuss the merits of the Bolthorn Warlord for the Jotune. 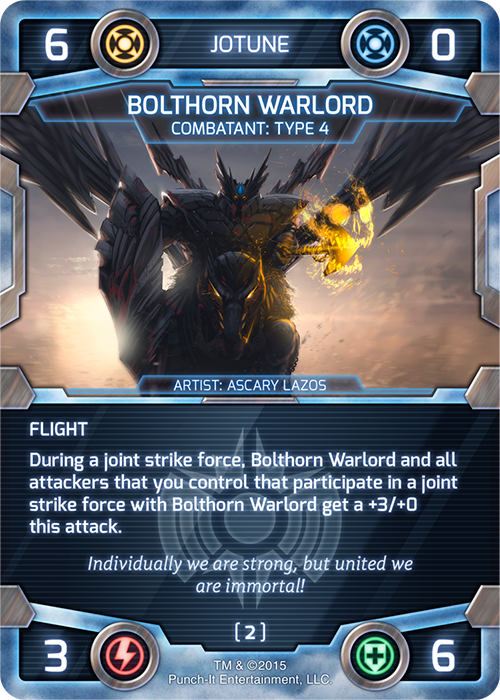 The Bolthorn Warlord was found in many early Jotune deck builds because of its statistics and powerful abilities. It was abandoned rather quickly in favor of Lord Oathki "The Hawk" and Lord Fenris "The Wolf." Both are excellent choices but the Bolthorn Warlord could be used in lieu of Art of War altogether. Theoretically, Bolthorn is a more powerful combatant buff than Art of War, but it is more susceptible to powerful abilities such as Centropolis. Players going the route of Bolthorn Warlord over Art of War should consider leveraging Evasion only for their warlords and building up a sizable attack force very early, in order to enable Bolthorn Warlord to be played using Strength in Numbers. Fortunately, the Jotune are well equipped for this using Gray Harrier, Sheild of Hrothgar, and Vassad Saboteur. These combatants can easily be half of your total combatant list, which further reduces the sularium cost of the entire deck. Making it easier to flood the field with helpers that will all benefit from the powerful Bolthorn Warlord. Forgoing Art of War in the build is a risk, but one that could pay off in dividends, if you also consider ditching the powerful Lord Oathki "The Hawk" in favor of Verker "The Berserker." Bolthorn Warlord is one of the few buffing cards that does not care about faction when applying the buff, making Verker a very key component to the overall power of the deck. We hope this article has helped you as a player to consider options that maybe were left in the binders or deck boxes in the past. Many of these cards are very powerful and when thought about, and when players leverage them, they can be outright game changers. Particularly if your opponent is a seasoned Battle for Sularia player. These cards are simply not cards that many players account for and cannot be handled by all the tools in your opponents deck boxes, as many build more "meta" lists. Do you have a favorite card not mentioned on this list? Let us know about it below in the comments section. Every week the team here at Punch-It Entertainment will be featuring a card of the week. Each member of the team will weigh in on the card and provide various levels of feedback and insight regarding it. This is a new series for us and any feedback regarding perspectives on the cards is very much appreciated. In addition we'd love to here your thoughts on the card, whether that be an epic moment in game play, or just simply your impression of the card. I tend to be rather biased on the awesomeness of the Hekaton Warhulk and other combatant types that have the BARRAGE keyword. Admittedly, this is a very all-or-none keyword, but in early development, I wanted to design a mechanic that simulated an area-of-effect ability. Something that really engaged in the unique aspect of the two resource row (AKA, sites) that our game had – BARRAGE ended up being that answer. While we designed a number of BARRAGE combatants, the first, and I think still the biggest, was the Hekaton Warhulk, which also had one of the most badass names too – win-win. Visually, it had to be huge and imposing on the battlefield. The grittiness and scale that Filip Dudek incorporated in his final illustration was perfect and it ultimately inspired another card we will be featuring later – Crazy Joe's Explosives. If you are a Synthien player, I highly encourage considering fitting one or two of these engines of destruction into your deck. If you know what you are buying Hekaton Warhulk can be the perfect card. Hekaton costs 9 sularium and many games it will be unplayable; play it as influence where appropriate. What Warhulk does is translate a sularium advantage into a threat capable of ending the game single handedly and often in a single turn. It is great in Synthien direct damage decks. At first this may seem backwards because of the sularium maintenance but often direct damage decks can lack closing power. Giving their opponents unreasonable amounts of time to try and claw back into the game. Hekaton increases your threat density when you sorely need it and already are planning for a high sularium late game. Not only does Hekaton attack for 10 but the barrage trigger also often decimates your opponent sularium production. If they don’t already have a board to compete they no longer have the resources to reinforce. It can be kind of underwhelming against Centropolis where they are locking down you best combatant and you are paying for the privilege. Even in that case the Hekaton is often vindicated; aided by an evasion or just clearing the way for other relevant threats. This thing is a beast! It hits hard, the barrage does work on the rear sites that are normally being protected or it soften up some front sites for other combatants or tactics to finish off. You always want to have a few of these in your Synthien builds. For the direct damage builds, it gives you some finishing power if you aren’t pulling that final Sularium Tactical Assault Beam and for the aggro builds, it’s going to be hard to find something more aggressive than this right now. Hekaton Warhulk represents a sneak peak into the future of Sularia. His card text eludes to why Novum and Animus needed to build it. There are many massive threats in Sularia and the Synthien needed an answer. This was the inspiration for the design of the card. Equipped with shoulder mounted missle launchers and a high powered laser system. Hekaton is a serious threat on any battlefield. As all of the guys have discussed above, Warhulk is exactly what the Synthien battle commander needs for improving there position on the battlefield or overcoming insurmountable odds. Who doesn't like puns and word play in general? Ha! Johnny happens to be my 'creator' card for the Blood, Profit, and Glory expansion. Johnny is based on my gunslinger in SWTOR. If you were into PvP from 2012 to 2015 or so, you probably ran into Johnny at some point in various random warzones. For our game, I wanted to introduce a traditional sniper or bounty-hunter type and complimentary mechanic. The end result literally became BOUNTY. We went back and forth a lot with how to dial this in and I can't complain with the end result. He's not quite beast-mode as a Mercenary like Verker with his BERSERKER keyword, but he offers some unique utility and control capabilities – having QUICK too also allows for that element of surprise that no other combatant up to this point has (SPOILER: there are more QUICK combatants coming). Wizyakuza did a fantastic job of capturing the gunslinger in his natural 'guns-a-blazing' moment. We were also fortunate enough to get Tots to illustrate an alternate card art image – similar, but different enough to make both images really stand apart. To learn more about Johnny and see him in action, check out our fiction from last year. The last few chapters in particular really highlight him. "Gunslinger" Johnny Cache is a great card looking for a target but that target can be hard to find. Art of War scales past him if you don’t get started early and Synthien’s higher base defenses values means most combatant are difficult to bounty profitably. He is however a great answer to Vassad Saboteur and can help you “go bigger” which can be critical in Jotune mirror matches. With reasonably even tempo hands the first Vassad Saboteur to stick is nearly a hard lock due to the value and tempo generated. Often the player without the Saboteur has to hold back combatants in fear of the activated ability. Even if they do not hold back they will be severely hampered in their ability to race. This wrinkle in the metagame incentives Jotune to become more controlling for wins in the mirror. Johnny Cache helps in the mirror while remaining aggressive for Jotune’s Synthien match up. "Gunslinger" Johnny Cache is a tribute, as John mentioned above, to his Star Wars Knights of the Old Republic gunslinger. Johnny currently has a limited amount of targets for his ability at this time, but will soon find in Reign of Terror more targets than he most likely can handle. Because of this Johnny appears a little over costed in the current meta. Although as a 4/4 with QUICK, Johnny can be devastating to an opponents defenses in the early game. With many of the most successful tournament lists running Sularium Excavator, and now with Projectus and Vassad Sabotuer. Johnny is getting good targets, and serves as a perfect tech card to those threats. Johnny's real power comes in the ability to get just one counter on him. If you do, there is an infinite amount of possibilities regarding his capabilities and control. Johnny represents a design goal we hope to implement further not only with the mercenary's of Sularia but also the other soon to come factions. He is an appetizer, albeit one that could be the main course as the game progresses forward. It is only a matter of time before Johnny makes consistent appearances on Battlefields all across Sularia. You better have what it takes to fight him, or his wrath will be quick and ferocious. Oh Johnny Cache, you make my Vassad Saboteur's go down in a burning ring of fire. Your bounty ability makes you rich with +1/+1 counters that can scale frightfully quick and a pain to take care of. I like this guy, he really only needs to get 1 or 2 bounty abilities off to make him really strong or you can still just straight up swing with him to help out take a site the turn you drop him! Some people will get super focused on his bounty ability and sometimes you have to know when to just use him as a beat stick on a site. At first glance many Synthien players will want to consider Shield Generator in their direct damage builds featuring Sularium Tactical Assault Beam, Feedback's, and Sularium Flares. In all actuality this site was made mostly for the aggressive Synthien lists. Synthien tactic and conditions are very expensive. The cost of incorporating them and Shield Generators is too prohibitive to allow the use. However, many of the Synthien's best aggressive threats are one construction point. Shield Generator was designed as part of the early Battle for Sularia prototype and many of its aspects have remained exactly as originally designed although some did need to be changed. For example, it has always been at 4 influence cost and really put a damper on Synthien players decisions between Centropolis and it. It has always provided +2 defense to all of your sites and it has always been a card that really breaks downs the Jotune, and other factions, combat capabilities. Before we implemented 60/90 construction, you could almost guarantee the card was used in mass. Now as we move forward with the new meta, and construction cost system, Shield Generator is good, very good... but it is a card you definitely will have to build around. The turtle card! I see this card included in the turtle Direct Damage builds. Probably only running 2 of these cards in a deck and it offsets one Art of War. Shield Generator paired with a Centropolis can be a strong site combo that will normally make your opponent fail, or just barely break through a site so you're not taking any extra damage. Shield Generator is a really hard card to evaluate. The upside is there and when you see someone stabilize behind a Shield Generator the power of the card is evident. Unfortunately I think the card is a little too narrow to fit all Synthien decks. The decks I am most excited to play it in is site focused control decks. Basically the game plan is to use Shield Generator Installation, Experimental Weapons Base, and It’s a Trap to extend the game to the point where you can play Satellite Network Facility. The Network Facilities lock up the board providing unparalleled inevitability. Shield Generator helps keep you alive until turn 7 but they also make the Network Facilities harder to destroy which allows you to get them out in multiples. Shield Generator sometimes fails on its own, but if you put enough pieces around it the ability truly shines. The name may not be all that original, but man, it is such a good fit and cool card! It's hard to imagine any Jotune deck without this in play – it's just that good! Speaking of being just that good, Ascary Lazos is one of those good at everything artists it seems – no complaints here! Colors and compositions can be unexpected at times, but somehow always work, and Art of War is no exception – great card and great art! To be fair, we've been very lucky with all of our core group of artists. As for Art of War itself, as I mentioned, it is typically an auto include for me. I don't always talk about my play strategies, but I'll freely admit to trying to always fit four of these in my Jotune decks. The only time I don't include four is when I am running an experimental Warrior and Bolthorn Warlord build. I run 4 of them in every Jotune deck and then make sure I have 5-6 Jotune Type 1's to trigger the +2/+2. This card to me is a must have. With the Synthien trying to lock down your big hitters, this now makes your little guys not so little. With Satellite Network Facility, I like to have 1 Art of War up by turn 4 if possible and end the game by 6 or 7. A single Satellite Network Facility is alright, but if they start dropping more than that it gets real scary. Art of War gives the punch through needed to get that damage on the table quick and I can even leave a defender back to absorb damage when they are going after my key Jotune 4 drop sites. There is no doubt Art of War is a build-around-me card. It makes demands of your deck construction; it makes otherwise good cards worse. With all that said I start every Jotune list with four copies. The payoff is just too high to ignore. Games are often decided by combatants and their proxy sularium generation. Even stuck on sularium Art of War lets your combatants trade up the curve and compete with what would otherwise be an overwhelming force. With the number of quality combatants in the Jotune Art of War often directly pushes damage ending the game while you are still ahead. Because of the need of types one I will often run 2-4 of each Lord Oathki or Lady Worgana and Lord Fenris to hit a total of 6 type ones. It seems Lord Oathki and Lady Worgana directly compete for the same deck space so I currently do not run them in any of the same deck lists. Art of War is the definitive staple of the Jotune design. Early on, I wanted to bring meaning to the powerful characters of Sularia. These unique characters are referred to as type 1's. The Jotune design philosophy was based around two major principles. First, the Jotune were all about leveraging combatants to win victories for their battle commander. Second, the Jotune type 1's need to matter more so than other factions. Art of War strikes this balance perfectly. The Jotune are weak to combatant removal effects such as Feedback. Sularium Tactical Assault Beam, and Centropolis. These cards have major utility against a faction that needs combatants to win. The beauty of Art of War is in its ability to push a small band of combatants through Synthien defenses for big wins. It also serves perfectly to protect Jotune combatants from Satellite Network Facility's in the late game. Jotune players not running Art of War are on the clock. With the new warrior builds there may be a reason to not run Art of War, but even in those builds it can only serve to make the deck better and stronger. COTW – K.Y.Z.R. "THE OMEGA EXPERIMENT"
This weeks card of the week is K.Y.Z.R "The Omega Experiment" get insight from the Sularia team about this card and what makes him a literal monster.